Know what to do if you’re involved in an accident with someone uninsured. Getting into a car accident is no pleasant thing. Getting into an accident with someone who doesn’t have car insurance is that much more frustrating. While California drivers are required to carry some auto insurance, not everyone does. In fact, 14.7 percent of all drivers getting behind the wheel in California don’t carry any coverage. If you are involved in an accident with an uninsured driver, here’s how to handle it. Even if the accident is minor and no one was injured, it is best to call the police so an official police report can be created. Even if the uninsured driver insists you don’t call the police, it is best to for your own sake. The uninsured driver may offer you cash at the scene of the accident to make the problem disappear. It is incredibly important that you don’t accept cash. You never know what injuries may surface after the accident, and medical expenses can cost hundreds, if not thousands, of dollars. In addition, it is impossible to know how much damage is done to the vehicle and what the repair bill will cost. Take pictures of the scene of the accident, damage to your vehicle, and any injuries sustained. Write down eyewitness’s information, and get the name of the driver and their registration plate. When it comes to filing a claim, the more information the better! Inform your insurer as soon as possible to let them know you have been in a car accident and that the driver is uninsured. 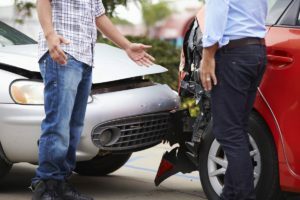 If you have uninsured/underinsured motorist coverage in your auto insurance policy, this coverage will kick in to help pay for expenses relating to the accident.